Place the silicone molds onto a baking sheet. Reserve space in your freezer for the baking sheet. 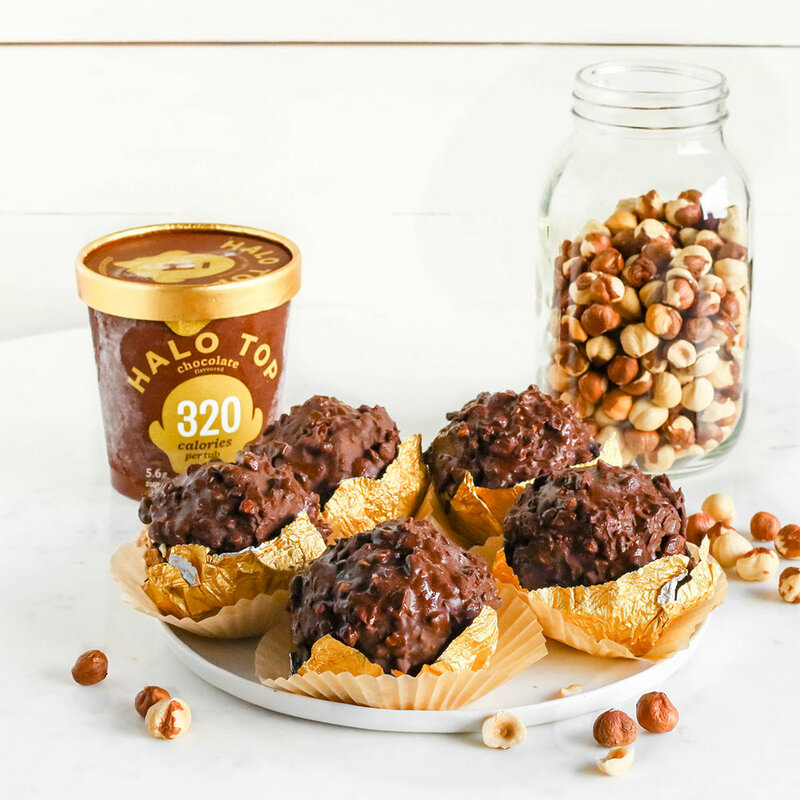 Scoop the Halo Top into the molds and spread it out until it’s even. Place the baking sheet in the freezer for 2 hours. Use a ½ tablespoon measure to scoop out wells in the center of each well of ice cream. Spoon 1 teaspoon of Nutella into 6 of the wells, then press a hazelnut into each spoonful of Nutella. Place the baking sheet in the freezer for 1 hour. Working quickly, transfer the frozen half-spheres of ice cream onto the baking sheet. Place the half-spheres of ice cream onto the half-spheres with Nutella and the hazelnut to create an ice cream ball. Place the baking sheet in the freezer for 1 hour. In a shallow dish, add the crushed waffle cones. Roll the ice cream spheres in the mixture until coated, place back on the baking sheet, and place in the freezer for 1 hour. In a small bowl, stir together the melted dark chocolate, melted coconut oil, and chopped hazelnuts. Pierce an ice cream sphere with a fork and spoon the chocolate all over the sphere, then place back on the baking sheet. Repeat this with the rest of the spheres. Place the baking sheet in the freezer for 1 hour. Enjoy!